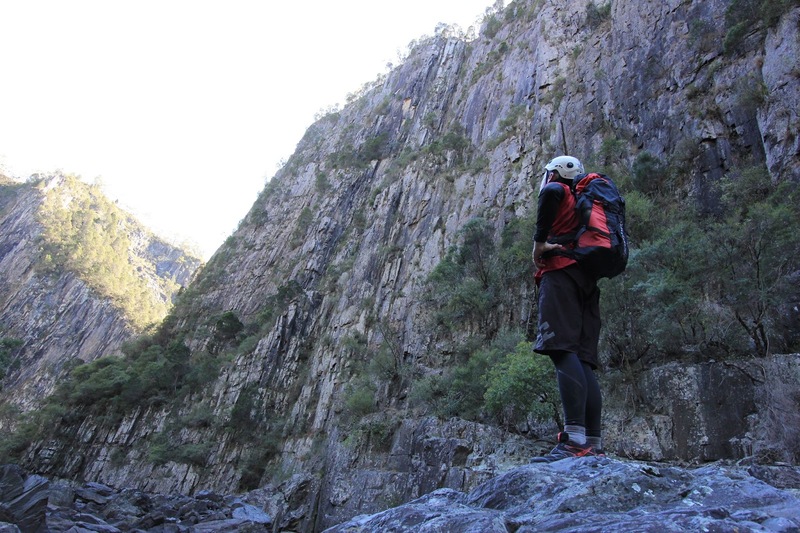 It is time for some unfinished business in one of NSWs most spectacular, rugged gorges. 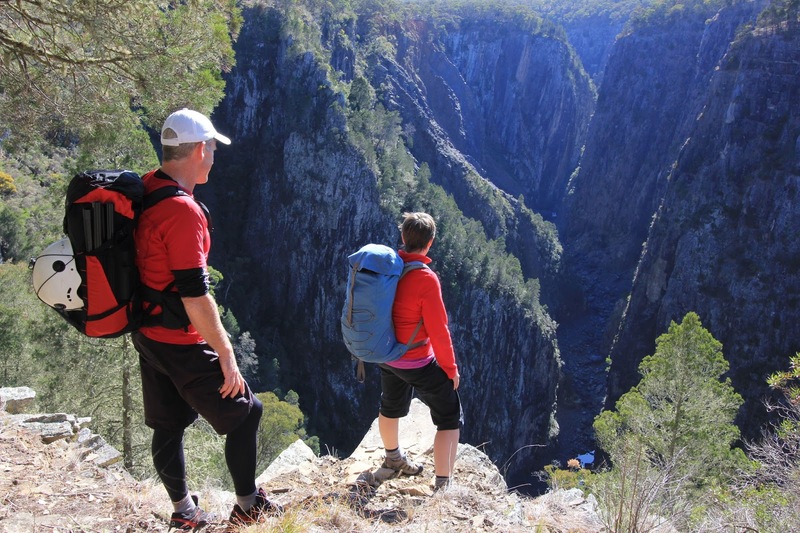 This is the story of our long-awaited attempt at successfully completing an adventure through Apsley Gorge, from below Apsley Falls to 5km kilometres downstream. We are tackling the return trip as a lightweight, one-day expedition with our friend Brad coming along. And, things start well. Caz picks a great line down our steep entry ridge. 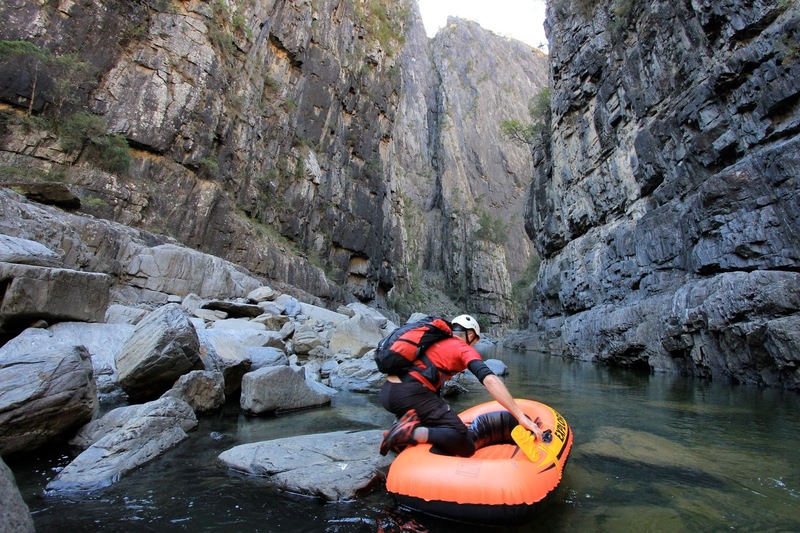 It is the quickest and easiest descent onto the gorge floor that we've ever had on this route (practice makes perfect)! The scenery is certainly no less spectacular second time around, (see our previous blogpost here for background to this 'unfinished business'). Sheer rock walls tower 100-140 metres above us. It is nice to see Brad's excitement and amazement at the rugged, stunning surroundings. There are three pools to cross, and sections of rock hopping, before we reach the point where last time I pulled the pin on this adventure, about 1km downstream. At the first waterfall Caz and Brad rig up rope and we slip on our harnesses to abseil down the short drop. We cross one more small pool, down climb the next waterfall and from here on it is new and unknown territory ahead. 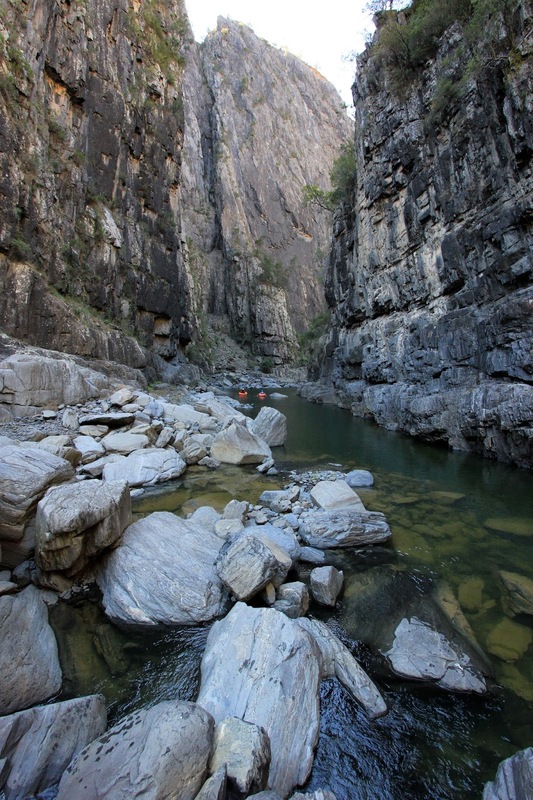 Paddling the long pool at the base of the second waterfall is truly breathtaking - the gorge walls rise either side, just 10 or so metres apart - with the world towering high, high above us. Caz pulls his camera out and soon lags behind. It is an awe-inspiring photographic location. At least with Brad in tow, I get a rest from having to pose for photos and so I paddle ahead. Getting in and out of the pools is the trickiest operation on this trip. The rock is sharp and the boats only thin vinyl. The little inflatables are also vitally important in keeping us out of the hypothermic water so landing them safely is our number one priority. 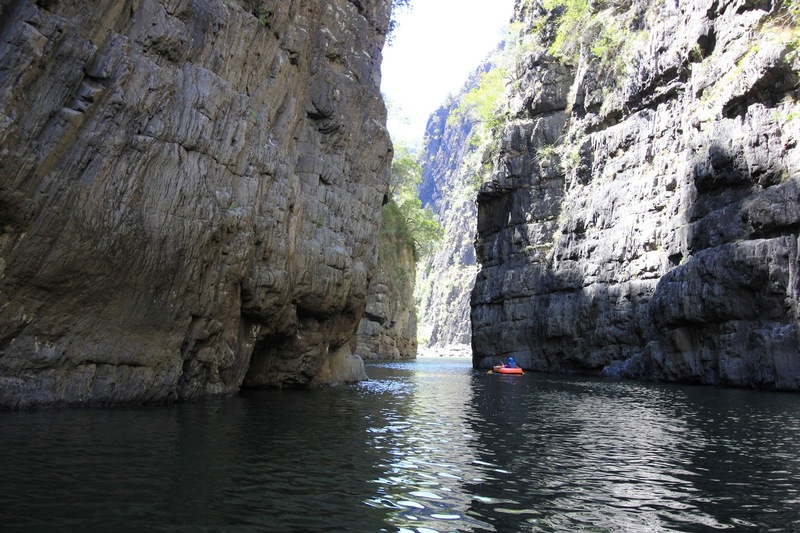 I exit, as the boys are still paddling around gleefully in the gorge, and begin to rock hop ahead. I clamber over a few large boulders to where the gorge turns right around a jutting and narrow fin of rock. Not wanting to get too far ahead, I wait here for Brad and Caz thinking it's a good time for morning tea. I wait and wait. Then I wait some more. Finally I decide to backtrack. They have been far too long. Disaster scenarios are coursing through my mind. Someone's holed their boat? A boulder has dropped on someones head? Who knows? But again, even disaster is a relative term, a bit like success or failure. 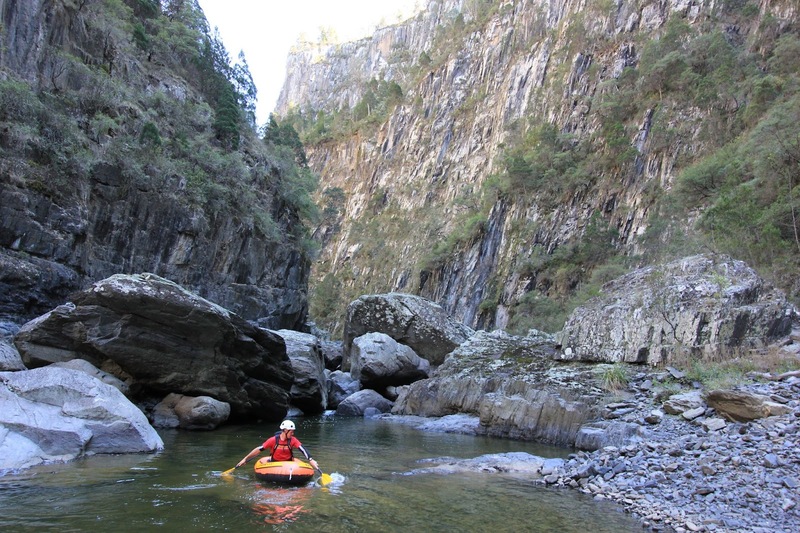 The boys are alive, the boats intact, but Caz's camera has been for a swim in the gorge. It is dripping wet, even inside the battery compartment. Tiny droplets of moisture are visible inside his favourite wide-angle lens. The camera won't turn on. A simple accident but a fatal one. Apparently there was a moderate amount of cursing that I missed. It now means we will have no photos of the stunning, rugged adventure that lies ahead. So I am changing tack here, or rather changing tense, from present to past, because it is now up to me, and words alone. Unfortunately, at the time, I didn't realise how many amazing moments there would be to remember. The adventure was physical and non-stop for more than eight hours. There was no time to sit and take notes along the way. So overwhelmed and exhausted was I at the end of the day, trying to remember every twist and turn of the gorge floor seemed impossible. The day after the adventure Caz and I sat quietly in the campground trying to make detailed notes of what we had seen. After the death of the camera we remembered this: a big landslip on the left, with a decomposing cow. We climbed around some big boulders and around the fin of rock on the bend then there was 1km of cruisey walking, like it was another river - rocky, straight, river oaks and narrow flats either side. Half way down this section, the river disappeared completely, flowing underground and out of sight. We stopped for lunch where Stoney Creek Falls came in from the right (west) - it was a pretty waterfall and provided us with good water because the Apsley was still hidden under the rocky gorge floor. After this; a block up of large, difficult boulders and then landslips filled up the river bed. We remembered to keep looking up and saw unique pinnacles jutting out of the cliffs – one we nicknamed the Matterhorn and the other Hail Mary. She was there in the folds of her gown of rock praying for us. Finally the river showed itself again, disappeared again and reappeared. I remember Brad made us all clamber onto big boulders in the centre of the gorge to see the spectacular view ahead. Another pool of water lay below but the gorge walls had closed in and loomed just three metres apart. We had to paddle through the narrow gap and we launched into the water from under a large boulder and floated through the chasm. It would have made an amazing photo. We were in and out of the boats all day. Paddling 10 metres then jumping out again, throwing the packs on for a short rock hop, then back in the boats. This was alright for Brad and I, with our tiny light day packs. Caz was lugging the 50 metres of rope and the gear we had brought just in case of bigger drops. His pack was heavy work, in and out of the boat. The rock orchid show would have made an even better photo. We paddled around one long pool and were greeted with a towering wall festooned with ledges of flowering creamy yellow orchids – hundreds of plants, lined along the sloping cracks and crevices in a breathtaking display of natural planting. All day the walls of the gorge had been covered in clumps and sprays of flowering king orchids. Kilometres of them. Here's a link to another of our blog posts (see the photo at the end) if you want to get an idea. By 2:30pm the gorge slowly opened out and the pools gradually got longer and longer. We even passed a couple of decent, small campsites. Everyone was getting tired and fatigued. Brad started to run little rapids in his Explorer 200 and he began to walk through the water to make better time. About 4.30pm we started looking for our planned exit ridge but first we struck the biggest waterfall yet and if we planned to abseil it, we would finally need most of the 50m rope in Caz's backpack (the waterfall was at least 20m high). A quick map check though and we decided the ridge to our right, above the waterfall, could do us for a way out. It was earlier than expected, but it was also later than expected – if that makes sense. We were running out of spring sunlight. 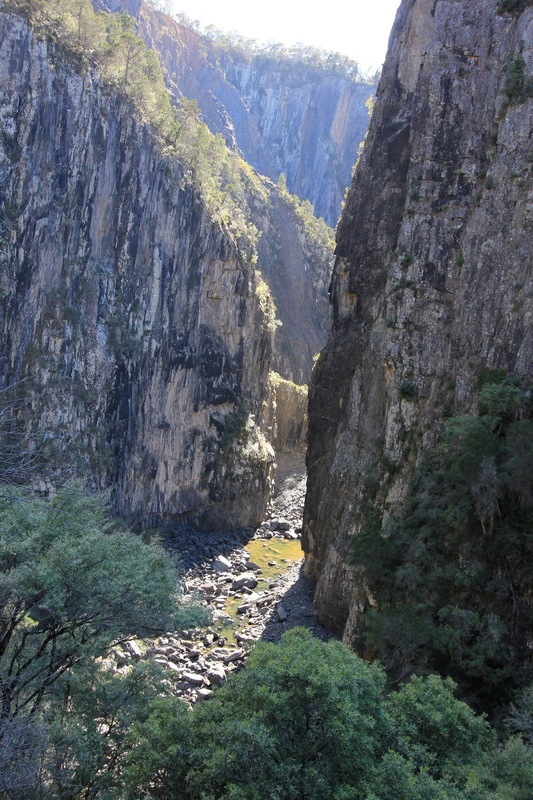 The final shot - our newly named Canon Gorge! A steep, loose, crumbling start got us onto the ridge which turned out to be a classic - a razorback of rock. My legs were exhausted and the boys were kind to me as I got slower and slower as we got higher and higher. It was an airy, tiring ascent. When we reached the top, and it flattened out, I was like a horse given its head for home – I could smell the end. A final stroll across some farmland and there was Brad's car. We gave the local landholder a quick ring and thanked him for the permission to cross his private property. Then, the sun set. We were done. We drove back along the farm fences to the road and yet our "unfinished business" was still unfinished. I am sorry we have no photos of what we saw down there. I can’t believe it, but we are going to have to go back and do this all again. Oh no!!! I can most definitely sympathise. Will accidental cover come through for the camera? This looks stunning. A bit out of reach for a day trip from Brisbane, but this is definitely now on my radar for a trip down that way sometime. Unfortunately Cameron the camera had no cover, so one of our more expensive adventures! BUT…what a place to go! I love reading your posts of your adventures and exploration. I'm curious where you get your information from as I've looked for track notes on the Oxley Wild rivers etc but found practically nothing available. 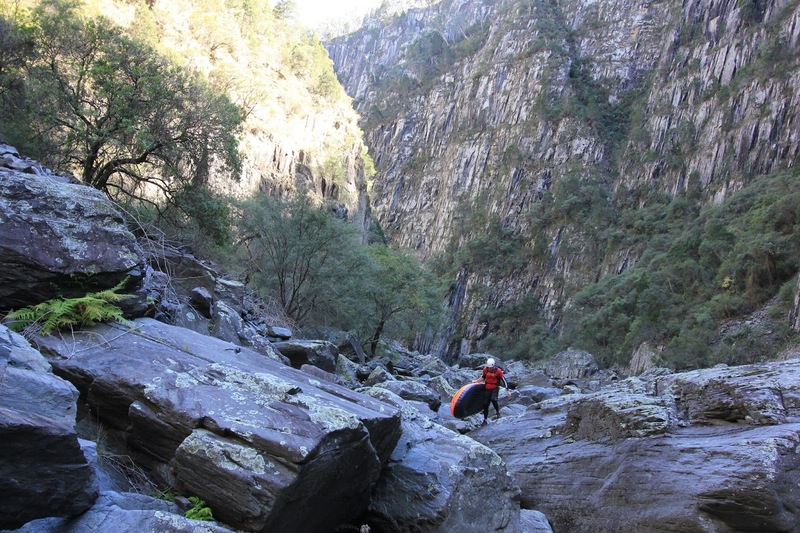 I come from SYndey originally and there is so much info on canyoning in the Blue Mountains but almost nothing else. Hi Unknown! Thanks for reading our blog. 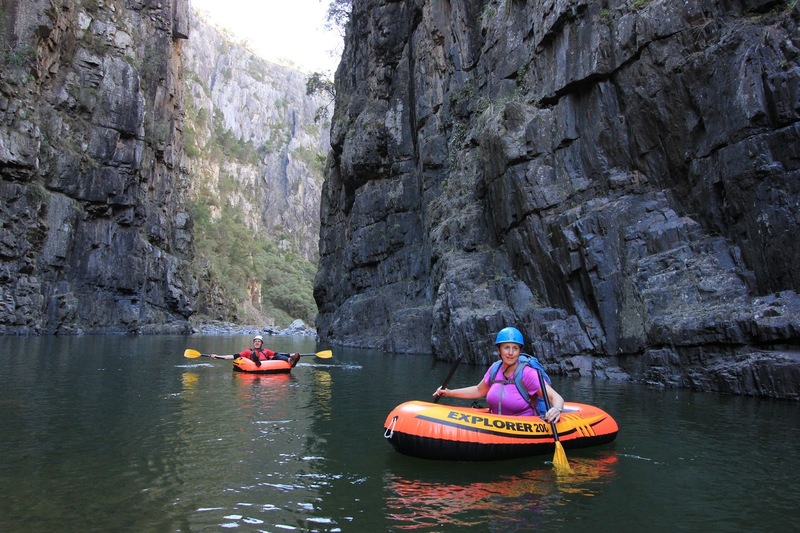 The above trip into Apsley Gorge did require crossing private land and so prior permission from landholders is always needed. That sort of information comes from knowing your local topographical maps, talking to local national parks rangers regarding access, and a couple of old local reference books. If you want more specific information regarding books feel free to email us at awildland at gmail dot com. Cheers and happy adventuring. Thanks! When the weather warms up I might try and do a bit of exploring up that way. Have fun Dave. It is a spectacular location, and an active one (i.e. rock falls are quite common down in the gorge!). 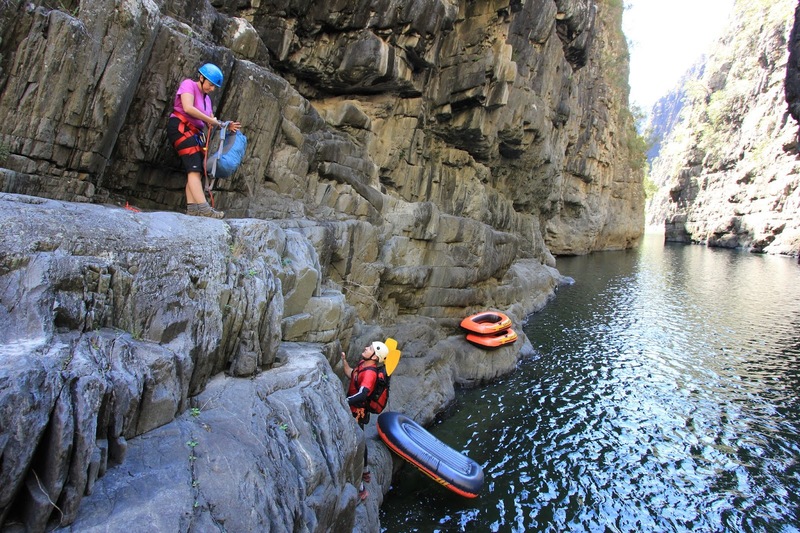 Also, accessing Apsley Gorge sometimes requires crossing private land and so prior permission from landholders is always needed. You can get details from the local National Parks office. Thanks for visiting our blog. Thanks Chris! And, feel free to email us anytime. Happy adventuring.